There's one: Richard Hellman heads toward an egg in the 2-4 year-old section of the Deming Park egg hunt Saturday afternoon. Some 10,000 eggs were found by kids from 2-12 years old. 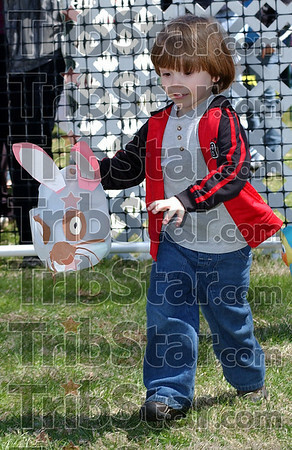 In addition to candy in the eggs, about 3,000 tickets for prizes were found. Bicycles, a family pool pass to the park pools and video games were among the top end prizes. American Legion Post 104, Express Employmenmt Services, First Financial Bank and Olive Garden were among the sponsoring businesses. Employees of Texas Road House donated their time to help organize and the business helped with prizes.